Increasing the minimum wage would give thousands of Massachusetts workers a raise and provide them and their families with additional resources to pay for basic necessities. A full-time minimum wage worker in Massachusetts will make $16,000 in 2012, more than $5,000 less than he or she would earn if the minimum wage had the same value as in 1968 (about $10.58 per hour, or $21,160 a yearfor details on changes in the value of the minimum wage, see http://www.massbudget.org/report_window.php?loc=whatsitworth.html). A minimum wage increase would directly raise the wages of all workers who earn less than the new minimum wage, and past experience suggests that it would also help lift wages for other low-paid workers. The actual number of workers affected either directly or indirectly by a change in the minimum wage depends, of course, on the exact size of the increase. A model developed by the Economic Policy Institute, a national non-partisan think tank, projects that increasing the minimum wage to $10.00 per hour would affect about 581,000 workers and over 200,000 children who live in households with a low-wage earner. An increase to $9.00 per hour would lead to pay increases for about 330,000 workers, while an increase to $11.00 per hour would affect about 800,000 workers. In Massachusetts, nearly half a million workers earn less than $11.00 per hour. This group represents more than one in six workers in Massachusetts, those who occupy the lowest end of the wage scale.1 In contrast, the median hourly wage for all Massachusetts workers was $19.81 per hour in 2011. Most workers earning the minimum wage73 percentare 20 years old or older, and 69 percent have at least a high school degree. 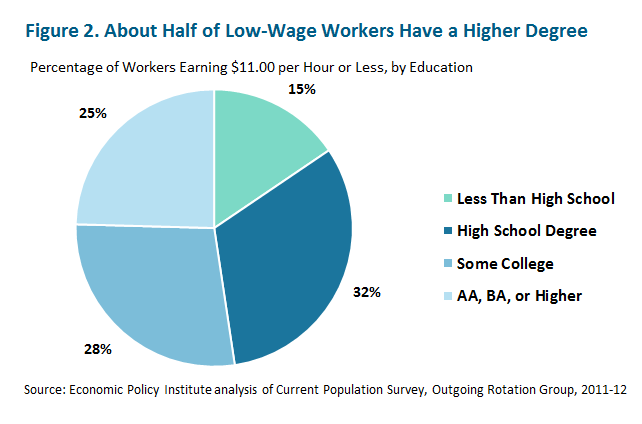 Looking at the broader group of low-wage workers who earn less than $11.00 per hour, 85 percent have at least a high school degree, and 53 percent have some college education or a higher degree (see Figure 2). More than three-quarters of these low-wage workers work at least 20 hours per week, and 38 percent work full time. Minimum and low wage workers are also more likely to be women and live in low-income householdsabout 60 percent of minimum and low-wage workers are women, although women represent only 51 percent of all wage earners. 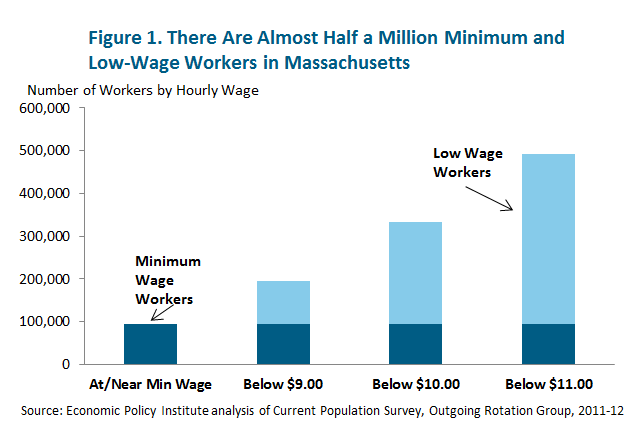 More than one in three minimum and low-wage workers live in a household with total incomes of less than $30,000 per year (about half the median household income for Massachusetts). About one in five minimum or low-wage workers is a parent, and approximately 180,000 children in Massachusetts have at least one parent who earns under $11.00 per hour. Minimum wage increases have direct and indirect effects. The fact that raising the minimum wage will provide an immediate wage increase for current minimum wage earners and anyone earning a wage below the new minimum is a direct effect. Increases in the minimum wage also tend to lead to wage increases for workers who earn somewhat above the minimum wage. In some cases labor contracts require rates of pay that are linked to the minimum wage, but even in the absence of such contracts employers often increase wages for other workers in order to maintain overall pay scales. These are indirect, and less immediate, effects of a minimum wage increase. 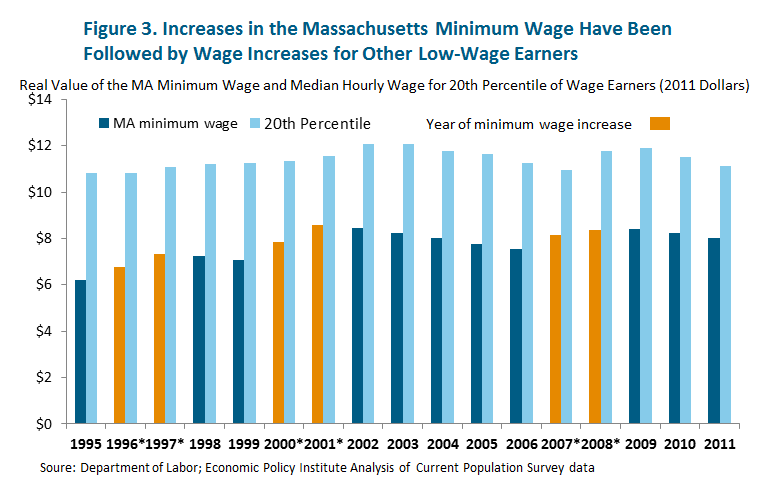 Recent experience in Massachusetts reflects this so-called "spillover effect"--as Figure 3 shows, increases in the Massachusetts minimum wage have typically been followed by increases in hourly wages for other low-wage workers. The number of low-income workers who would be affected, either directly or indirectly, by a minimum wage increase varies depending on the size and timing of the specific increase. A model developed by the Economic Policy Institute (EPI) that is based on census data on wages and work hours, estimates the number of workers who would be affected, either directly or indirectly, by one of three potential increases to the Massachusetts minimum wage: a) from the current level of $8.00 per hour to $9.00 per hour; b) from $8.00 per hour to $10.00 per hour; and c) from $8.00 per hour to $11.00 per hour. Each of these increases would go into effect on January 1, 2014. This paper also provides estimates of the average wage increase workers would receive and describes some of the characteristics of workers who would be affected. A $1.00 increase in the minimum wage, to $9.00 per hour, would lead to a direct wage increase for just about 194,300 workers who current earn below that amount. About 332,500 people currently earn hourly wages below $10.00 per hour, and would be directly affected by an increase of the minimum wage from $8.00 to $10.00 per hour, and an increase to $11.00 per hour directly affect nearly 500,000 wage earners. Exactly how much more a worker would earn per week or year depends on the difference between his or her current wage and the new minimum, as well as the number of hours worked. For instance, a full-time worker currently earning the minimum wage would receive a pay increase of $4,000 per year if the minimum wage went from $8.00 to $10.00 per hour ($2.00 x 2000 hours), while a half-time worker earning $9.75 per hour would see his or her pay rise by $250 for the year if the minimum wage increased to $10.00 per hour ($0.25 x 1,000 hours). As Table 1 shows, the average pay increase for directly affected workers would be $1,760 per year if the minimum wage increased to $10.00 per hour on January 1, 2014, based on estimates of the current wage distribution and hours worked by these workers. The difference between this estimate and the maximum potential increase of $4,000 reflects the fact that most of the workers receiving an increase earn slightly above the current minimum wage and not all work full time. If the minimum wage increased to $9.00 per hour, the average increase for the approximately 194,300 workers who currently earn less than that amount would be $917 per year (the average increase assumes that a wage earner works 52 weeks per year). As noted above, workers who earn wages somewhat above the new minimum wage would be indirectly affected by a minimum wage increase. The effect on this group of low-wage workers would be less immediate and more modest; and not every low wage worker might benefitfor instance someone earning just below $11.00 per hour might not see a wage increase following a minimum wage increase to $10.00 per hour, while someone else currently earning slightly more than $11.00 per hour might receive an increase. Nevertheless, such an increase would provide millions of dollars in additional income to low wage workers, and larger increases would tend to lift the overall wage floor higher and affect more workers. The EPI model projects that an increase in the minimum wage from $8.00 to $10.00 per hour would indirectly affect about 248,000 workers, who would have average pay increases of $528 per year. Taking both indirect and direct effects of a minimum wage increase together, an increase from $8.00 to $10.00 per hour would provide an average annual pay increase of $1,234 for about 581,000 workers. An increase to $9.00 per hour would provide an average increase of $631 to some 332,500 people, and an increase to $11.00 per hour would lead to an average increase of $1,849 for a little over 800,000 workers. These estimates suggest that the aggregate pay increase from raising the minimum wagemoney likely to be spent in the local economywould range from about $209.5 million for an increase to $9.00 per hour (332,000 workers x $631 average increase) to $1.5 billion in the case of an increase in the minimum wage to $11.00 per hour. The overall increase in wages from an increase in the minimum wage would generally be distributed among workers in proportion to their presence in the minimum and low-income wage force. For instance, 60 percent of minimum and low-wage workers are women (although women account for only 51 percent of all workers), and they would receive about 58 percent of the aggregate pay increase if the minimum wage were raised to $9.00 per hour. One group of minimum and low-wage workers that would receive substantial pay raises from a minimum wage increase is comprised of parents (both married and single) with children. Just over 180,000 children have at least one parent who earns less than $11.00 per hour. Increasing the minimum wage to $10.00 per hour would lead to direct pay increases for about 63,000 parents and also affect their 124,000 children. 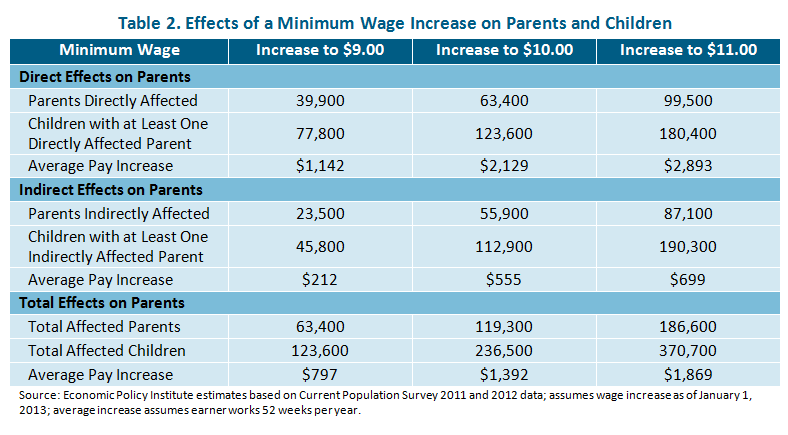 The average pay increase for parents in this group would be $2,129, about $367 higher than the average increase for all workers earning under $10.00 per hourthe difference probably reflects the fact that minimum wage workers who are parents are more likely to work full time in order to support their families. When workers who would be indirectly affected by an increase in the minimum wage to $10.00 per hour are included in the calculation, the number of children affected rises to about 236,500. Estimates in this fact sheet are based on analysis by the Economic Policy Institute that uses wage data from the 2011(4th quarter) and 2012 (quarters 1-3) Current Population Survey (CPS), Outgoing Rotation Group. The sample used is restricted to individuals aged 16 and over who are employed at the time of the survey and who report a positive wage value. It may understate both the number of total workers in Massachusetts, as well as the number of minimum wage workers. The model used to project the number of workers who would be affected by an increase in the minimum wage and their average wage increases assumes population growth of 0.032 percent (consistent with Census Bureau projections for Massachusetts) and assumes no wage growth from the 2013 wage values in 2014 (that is, someone who earned 8.50 in 2013 would be assumed to receive an increase of 50 cents if the minimum wage increased to $9.00 on January 1, 2014). At or near minimum wage: Refers to workers who earn between 90 percent of the minimum wage and $8.25 an hour. This is an appropriate way to measure minimum wage workers, because hourly wages must be imputed for workers who report only weekly wages and slight variation in hours worked per week could mean that some minimum wage workers would be excluded if the exact minimum wage amount was used as the cut-off point. Minimum and low-wage workers:For the purpose of this fact sheet, minimum and low-wage workers include workers making at or near the minimum wage (see above) and workers with hourly wages under $11.00 per hour, as estimated from the CPS Outgoing Rotation sample. This group is nearly identical to the lowest quintile of hourly wage earners in Massachusetts, who earned $11.12 per hour in 2011. Directly affected workers: Workers who earn an estimated hourly amount that is lower than a given minimum wage amount. For instance, someone who reports a weekly salary of $390 and works 40 hours per week would have an estimated hourly wage of $9.75 and would be directly affected if the minimum wage increased to $10.00 per hour. Indirectly affected: Workers who earn just above a given minimum wage amount would also see their wages increase in the period following a minimum wage increase. Depending on the level of minimum wage increase, this group could also include workers who are not counted as minimum and low-wage workers for the purpose of this fact sheet. The EPI model estimates indirectly affected workers as those with reported wages between the new minimum wage and the sum of the new minimum plus the size of the minimum wage increase. For example, someone who reports a weekly salary of $460 and works 40 hours per week would have an estimated hourly wage of $11.50 and would be indirectly affected if the minimum wage increased to $10.00 per hour. 1Estimates include individuals age 16 and over who are currently employed and who report a wage. Workers are considered at or near the minimum wage if they earn up to $8.25 per hour and low-wage if they earn below $11.00. The hourly wage for workers in the lowest quintile of Massachusetts earners was $11.12 in 2011in other words, the group of low wage workers described in this fact sheet are roughly equivalent to the bottom 20 percent of wage earners (seen notes at the end of this fact sheet for more details on these estimates). Information on this website provides nonpartisan research and analysis on the minimum wage and is not intended to promote or oppose particular proposals on this issue.